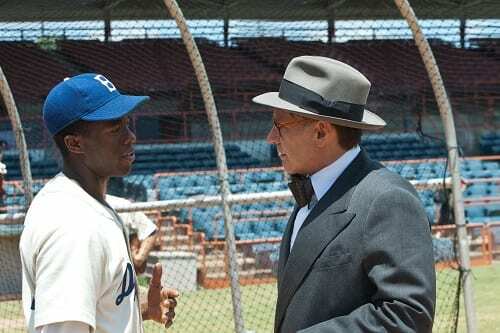 42: Harrison Ford Says Jackie Robinson "Had a Rich History"
Harrison Ford is a guy's guy if there ever was one. You can imagine our surprise at how emotional he got when the Star Wars legend sat down to talk about his new film 42, and proceeded to break down in tears. It started when Ford was asked about how 42 was clearly star Chadwick Boseman’s first big break as the legendary Jackie Robinson. The superstar was asked to recall how he felt when he got his first big role. “Well, I was an overnight success. It was just a real long night,” Ford said and laughed. Ford proceeded to get teary-eyed and couldn’t continue to answer that question. So, we went back even further and asked about Ford’s connection to baseball and if growing up in Chicago, the future Indiana Jones and Han Solo was much of a baseball player. “I didn’t play much ball. I wasn’t much of a ball fan. I went to Wrigley Field with my family. I remember, actually, Wrigley Field more than I remember the game or anybody in it. It was such a vivid visual image in my mind, still, of that square of improbable grass in the middle of the city,” Ford admitted. There was something about the environment of youth baseball that perhaps put off Ford, a part of the experience that anyone who has participated in Little League can easily recall. “The whole atmosphere of anxious parents and more anxious children, and it was just too much for me, and we as a family never went back,” Ford said and laughed. 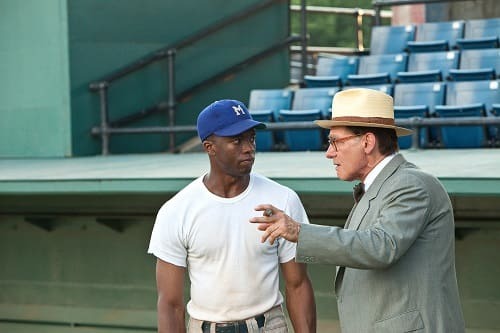 Ford was intrigued to portray a baseball and cultural icon in Branch Rickey, the General Manager of the Brooklyn Dodgers -- the man who brought Jackie Robinson to his team and made history by breaking the color barrier. “The thing that attracted me to this project was the quality of the script that I read, and the understanding, and the sheer capacity to know where success lives in the business of making movies. And I don’t mean box-office success. I mean, in terms of the quality of the writing and the ambition of the writing,” Ford said. As can be seen in the second 42 movie trailer, Rickey possessed a voice that was just one of the challenges presented to Ford in finding the character. “There was actually more audio tape available of him than there was visual material. 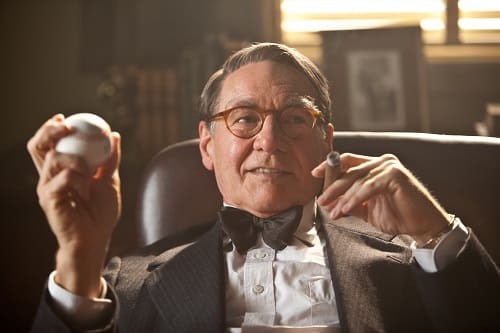 I studied all the photographs and early on, I had the idea that the film would be much better served by a Branch Rickey look-alike than a Harrison Ford look-alike. And I didn’t want the audience to go into the film thinking that they knew me from some previous experience in the movies,” Ford said. There was another bonus for tackling the role in 42, a chance to play a “younger” man. “You know that he was 65 years of age at the time and it gave me the opportunity to play a younger man, which is not gonna happen a lot any more in my career,” he said and laughed. Ford is also quick to point out that Robinson was a great man, athlete and force for change, long before Rickey brought him to the big leagues. “He was distinguished before his discovery by Rickey. This guy had a rich history,” Ford added. In the end, Ford cautions that as a whole… movies should be color blind, and that holds true for 42. “I think that the best movies are made not from a point of view that depends on your personal history, whether it’s the color of your skin or the politics that you’ve had or the place that you come from,” Ford said.